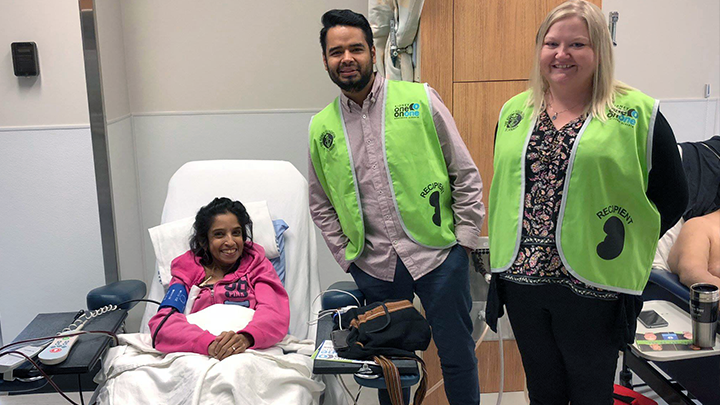 Kidney One on One volunteers Manuel Escoto and Erin Paut stand with dialysis patient, Sonia Dhaliwal. The Kidney One on One program connects people with kidney disease to volunteers who are able to share their personal journeys with dialysis and transplants and provide support from a non-clinical perspective. EDMONTON — Adjusting to life after facing kidney failure can be long and difficult. Adopting a new lifestyle takes its toll during longs hours in hemodialysis, waiting on transplant lists and getting used to new medications and diets. Patients have many questions and can feel lost in the complexity of their healthcare. “In terms of time commitment, dialysis becomes a part-time job. Many are unable to work, which creates financial stress and there’s a loss of freedom.” says Flavia Robles, Executive Director of the Kidney Foundation of Canada, Northern Alberta & the Territories Branch. To provide additional support, the Kidney Foundation of Canada has partnered with Alberta Kidney Care – North (AKC-N) and the University of Alberta to launch the Kidney One on One Program in Northern Alberta, designed to help patients adapt to their new realities. This initiative will initially be offered within the University of Alberta hospital dialysis program, with hopes to expand further within AKC at a later date. As the first program of its kind in northern Alberta, it will connect people with kidney disease to transplant recipients, living kidney donors, dialysis patients and caregivers who volunteer to provide education, share personal experiences and answer questions patients may have, from a non-clinical perspective. The program also hopes to increase awareness on living kidney donation for those waiting on transplant lists. Transplantation, especially from a living donor, is the most clinically and cost-effective treatment for kidney failure, but barriers, such as shortage of available kidneys and a lack of education, still exist. As the program works to boost awareness of what kidney patients face, Vanderzee says she finds the most important part has been the volunteers who selflessly dedicate their time to empower patients.